Beth-Good to see you! I can’t believe that your twins broke your rib! I guess I shouldn’t complain about mine being bruised! 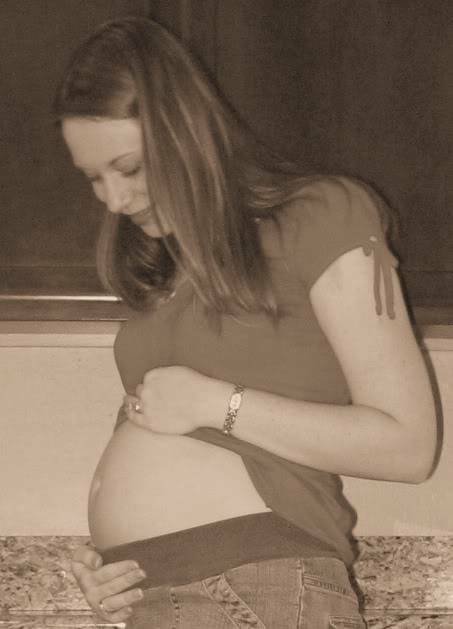 Kelly- I can’t believe that you’re past 34 weeks already! I’m so excited for you! Allison- I’m with you… I’ve only bought 2 onesies… If it wasn’t for all the stuff we kept we would have nothing! I still don’t have our crib up yet. (It’s still in storage about 2 hours away.. Lol!) Good luck on getting everything ready! Quincy- Glad that your appt went well! AFM- We had a very busy weekend! Friday, we went 2 hours south to visit family for the day. While we were there, we took Matthew to a pumpkin patch and he had so much fun. Saturday, we rearranged our bedroom, which took forever bc Robert wouldn’t let me move anything so I had to explain where I wanted our furniture. Sunday, we went through our closets and got rid of a bunch of stuff… Oh, and we had company for dinner. Yesterday, Robert went to work and I spent hours cleaning up after our company. Today I’m so tired that I’m not doing ANYTHING except cooking dinner. My next appt is on Friday and it’s an u/s, NST, and a follow-up. I’m not looking forward to laying on my back for an hour! Here it goes! Trying to post pics of Ryan's room. Let's see if this works. Oh yay! That did work. Here are some more pics for you! ETA: hmm... I'm not sure why the family pic is so tiny. Doesn't do you much good! The room is so cute TIFF!!!! I have done nothing for the baby yet. I guess I am still a bit scared. But I am 32 weeks now and I have been told that is a good number at this point. I just can't help but think after I have him and they do an echo they will find more problems. I wish I could just let my fears go and enjoy the pregnancy! Jennifer - Grandma is doing okay. I am the only one who has seen her since her surgery. I went over to bring dinner to my grandpa and she wanted me to come in and visit. She said that she hasn't felt up to any company and no one else has seen her but when Grandpa said I was coming over, she told him that if there's anyone she wants to see it is me She looked a lot better than I expected her to. She even apologized for not having her hair or makeup done in 2 months! She's so funny. She is recovering from the surgery but it was determined that she does need chemotherapy. She will start next week a pretty aggressive form of chemo - she will have it every day for 6 weeks. If that works, they are hopeful that she may go into remission!! Tiff- I know she does not know us, but can you let her know we are praying for her and think of her. She sounds like such a wonderful woman. Jennifer - thank you so much. I will tell her and I know it will mean a lot to her. I already told my grandpa about the conversation your daughters had when they told you they prayed for her and asked if she was better yet. He thought that was so cute. I guess she was feeling better the other day and so my grandpa took her to get her hair and nails done before she starts chemo. She is scheduled to start the chemo on November 3rd. It was pretty funny trying to explain to my grandpa about a friend from an internet mommy group! haha I don't think he really got it! I've been AWOL for a while as DH has been away and I've been exhausted. Normally I don't mind it when he is away, but last week it was really hard work. I took a leap of faith and got a high school girl to come with me and go through our storage locker to see if there was any baby stuff. I appear to have given it all away, so except for the co-sleeper I bought for DS, which all my friends have used since I obviously didn't, and some 2 yo + girl clothes. Oh, and a lot of cloth diapers, and a really revolting looking third hand baby bjorn. And bouncinette that has seen at least 5 babies through. I've washed and folded all the diapers, and made two new reversible covers for the bouncinette, which now looks pretty good (I did one in a patchwork of natural hemp fibres from a discarded sample book, and the other in a bright modern red & white Ikea pattern). The new sewing cabinet I built works really well - it is so nice to be able to get to the sewing machine and ironing board all the time, rather than having to labouriously get them out and put them away each time. I'm meeting up with my local online mothers group (late Dec moms) tomorrow, then having a girls high tea (in lieu of a baby shower) on Sunday. 9 weeks to go today! Baby is still transverse, feels like it is pushing my sides out. Sorry, not doing well with the personals, but have been following along. Tif - I love Ryans room, and am glad your grandmother is such a strong lady. I too have been AWOL - without a good excuse except plan exhaustion. I have been following along too and love Ryan's room and think that your belly is so cute Tiff. I had what will probably be my last u/s yesterday and according to the technician Kate is about 4lb 9oz. I had a room full for the u/s - DH, DS and mom and dad. My parents had been to see my sister's twin u/s last week and my dad really enjoyed it. So I invited him to mine after DH said he could make it. But then he changed his mind. It was nice they all got to see her - she is head down now (not that it matters since I'm have a c-section). I'm working from home today because apparently I have broncidis. My dr noticed it yesterday - I thought it was just a cold or allergies. But now I'm on a z-pack and hoping I didn't spread it to my co-workers this week. This week has also been hard on me - my aunt died on Wednesday, she was diagnosed with leukemia last March and seemed to have fought it off with chemo and a bone marrow transplant but last week she got an infection and it ended up killing her. I am not handling so well - it just reminds me of Jake dying and I feel so helpless again. I've had also been overly emotional lately - my dr said it could be because i'm toward the end of my pregnancy and I think it is because she halved my dose of prozac. Either way I'm crying a lot lately. Enough of my sob story. I think I'll go take a nap. I hope you all have a great weekend. Kathy - I am so sorry you are having a rough time! It seems like these last few weeks of pregnancy are always the hardest. But in a few short weeks we will all have healthy happy babies in our arms! AFM: is it weird that I think I am getting morning sickness for the first time this pregnancy now - at 32 weeks? Is that even possible? Now I don't think I had the stomach flu, I just think it is pregnancy related. Last night I ate dinner and felt perfectly fine. Then I woke up this morning feeling nauseous again. I ate breakfast and felt better, but it was not completely gone. Who gets morning sickness at 32 weeks? Weird! Kathy- I'm so sorry you're having a hard time, I have been too lately, I have chalked it up to hormones being out of control and a gripping fear that somehow this is not going to end well. I have absolutely no reason to believe that but it's really hard to believe I'm going to have a baby soon. Hang in there!! Today at NST things looked good till the sonagram. After like two months of Easton being head down he has decided to flip and is now breach! There is still a bit of time for him to turn, I am praying he dos. He u/s tech asked me if I have had a c-section before. I said no and she said oh so this would be your first. Can you believe she would say that! I am only 32 weeks 4 days! He still has time to flip again. She really should not say things that will scare Moms, especially when it is not soething that will for sure happen. Now I am a bit more scared. I have my next full U/S on Monday. I will be sure to check in and report any news. So sorry to hear about your Aunt your family will be in my prayers. Tif- I've got reflux, which makes me nauesous too. Breech ladies - my DD was breech, and was turned at 36 weeks. Definately an option to look into (called an ECV) if your babes don't deveop a better sense of direction. This one still seems to be transverse which is really uncomfortable. I had a great day - my local online mothers group had a meet - 7 of us at a chocolate cafe. Lots of fun. Tomorrow is my 'it's not a baby shower' girls outing. Can't wait. 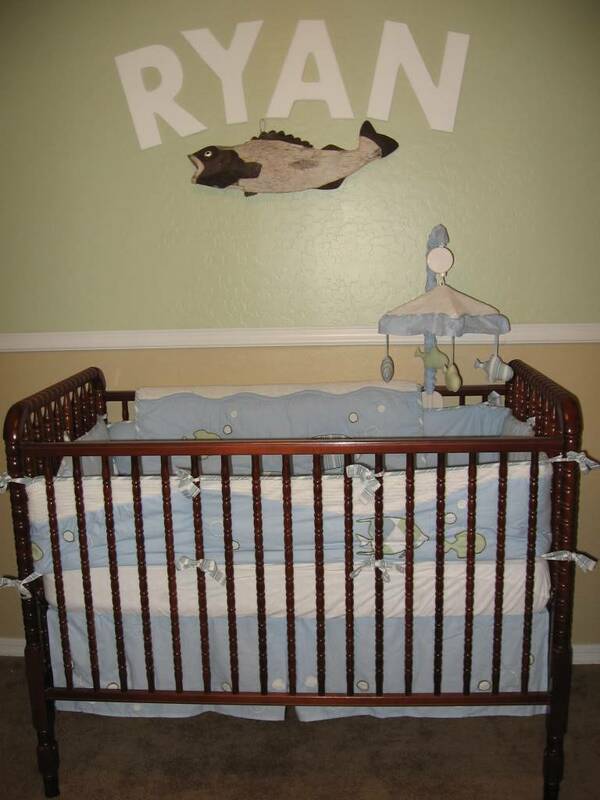 Tif- I forgot to say how cute Ryan’s room is! I’m so glad that your grandmother is doing well. Jennifer- What a terrible u/s tech! There’s plenty of time for Easton to flip! Hi to all I missed! AFM- Yesterday was my appt. I had an u/s and an NST. Both my boys are head down (yay!!). Twin A is measuring 3 lbs, 15 oz and twin B is 4 lbs, 3 oz. I was informed that I won’t be allowed to go past 38 weeks, which is a little scary. Also, they found bacteria in my urine. They’re sending it in to the lab and I should have some results by Monday, but my dr thinks that it’s just a mild UTI. During my NST, I had a few contractions. The nurse that was monitoring me asked if I felt them (duh!! They were halfway up the chart!) then asked if they hurt… Um, a little bit! She was nice but not very smart. Anyway, everything looks good with the boys growth, so I’m happy. KIM - I hope you have (had) a fun "it's not a baby shower" Let us know how it went! JENNIFER - Not having the head down is not a big concern at this point (from what my ob says). I asked when they really "lock and load" and I was told around 36 weeks. Plenty of time for baby to turn around! Try not to worry about any more than you already are! TIFFANY - 3rd tri morning sickness is pretty common. There is actually a thread about it on NBBC. I've been throwing up 1-3 times a week since around 26 weeks. It stinks, but it's definitely bearable! In my case, I usually throw up, but don't get nauseous. I hope you feel better soon. 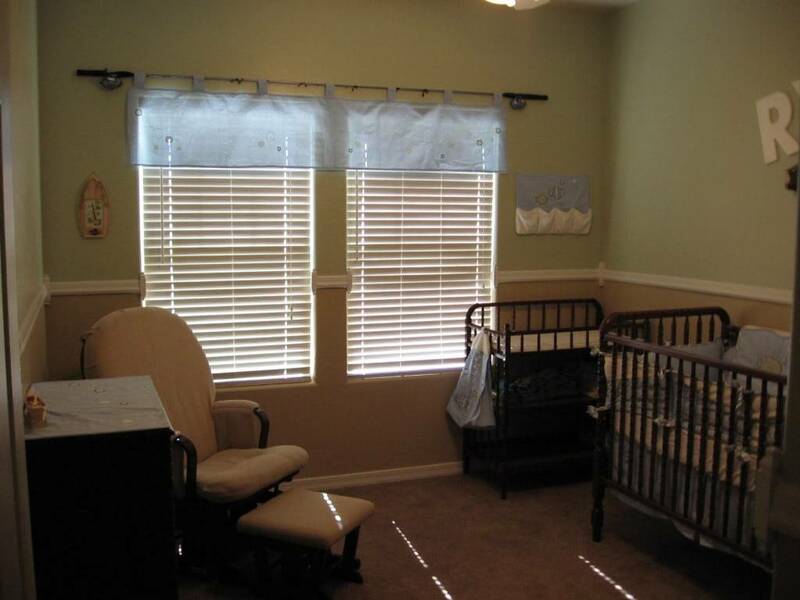 Ryan's nursery is beautiful! KELLY - I guess no news is good news! AMY - I hope that your doc gets the bacteria situation resolved as soon as possible. What a dumb nurse! It sounds like both babies are right on track for growth. Do you remember Jenell from the 2nd & 3rd tri loss board? She is pg again with twins. She's 21 weeks today and was just put in the hospital. She is dilated and her bag of water is coming out. Please keep her in your prayers. My heart is broken for her. AFM - BPP was a perfect 8/8 again on Friday. I've been given the official "no more work" from my doc. It's been a stressful week trying to work with hr and the outside company to get my disability all set up. I'm hoping it's resolved soon. My bps have been creeping up, but I think a lot of it is due to work. From now on, I see my doc weekly (in addition to the weekly bpps that I've already been having). He said that we can try to set an induction date next week! I'm excited to have a date to at least aim for! Allison - I read your post to Amy, I'm sorry to hear about Jenell. I will be thinking of her also. Yay for setting an induction date. I hope my doc will set one soon too. I will be induced around 38.5w. I'm glad your bpp was good. Enjoy your time off from work as much as possible. Try to relax and get some rest before your little one comes! Kathy- so sorry about your aunt, you and your family are in my thoughts and prayers. Tiff-I love Ryan's room and your cute belly...I was looking at pics from my shower Sat and I look like a huge cow, LOL!! Allison- Wow, can you believe we are so close that c-sec and induction dates are already being set? My induction date is set for Dec 17, but I have another u/s on Dec 2 to make sure Camden isn't too big, doc thinks he will be over 9lbs if we wait til his due date, yikes!! Kim-How was your "it's not a baby shower" day? Amy-congrats on the good news, I am just so excited about your twins. AFM-Sat was my shower and it was lots of fun, now my house is full of baby stuff and I haven't finished the nursery to put things up, hopefully the carpet in there will be cleaned tonight so that on Tue, I can move everything back in there and put stuff away..I need to feel organized, because I am so worried he is going to come earlier than expected. Oh, and ds got whip lash at his game Thur so he can't play for a week, poor guy! He is doing good though, just a sore neck. Just wanted to check in and say hello. Sorry I haven't been around much. I guess exhaustion and being busy are to blame. I feel a little overwhelmed with everything that needs to get done here and for work before the baby comes. I really hope everyone is doing OK. Things here are good. It's hard to believe in just a few wks we will all (hopefully!!) have healthy babies in our arms. I am freaking a little trying to read and learn as much as I can. We had a shower last wkd and once we got everything into the house it really hit us that our lives are seriously about to change. I am so excited and so scared at the same time. Healthwise, everything is good. My dr has me coming in weekly now, along with weekly NSTs. He wants to do an u/s in a couple wks to estimate her weight. I still have ctx all the time but I do my best to ignore them. I have noticed that sometimes when I bend over I feel a lot of pressure "down there," and that was the same pressure I had with Hope. So I don't know if it's just the baby's position, or she's dropped or what. I'm thinking it's just her position b/c I don't feel it all the time. Tif - Ryan's room is super cute. So is the belly pic! Jennifer - did you get the nursery done at church? Would love to see a pic. I'm sorry that u/s tech said that to you without knowing for sure that you would need a c-section. Kim - ouch on baby being transverse! How was the chocolate cafe? That sounds so fun. Amy - sorry on the UTI! DH is gone now right? How are you doing w/o him? Allison - I hope you haven't been in the hospital any more. I've been thinking about you. Yay on no more work! And especially, yay on getting to set an induction date soon! Quincy - hope you had a fun shower. I feel the same way - I want everything put away so I can feel more organized. I'm stressing a little. So sorry about DS getting hurt. Jill - Good to hear from you. We have been really busy as well so I know things can get overwhelming. But try not to stress! Even if you don't read every book ever written, you will have no problems knowing what to do! Once you have your beautiful baby in your arms, everything will fall into place. I know it sounds crazy, but you will just know what to do. Don't get me wrong, being a parent to a newborn is tiring and can be stressful but so worth it! I had a full U/S today and everything looked good. Easton is now 4 lb 10 oz. And .........He is now head down again! Yea! I know he would turn back. I was very sure of it. Stupid U/S tech! I am very tired tonight and I am going to head to bed. The kids and I are going to get flu shots tomorrow. Allison, my oldest, just got her last cervical cancer vaccine today. Poor thing gets a shot two days in a row. But she is good. She gets a bit nervous but never cries or anything. Actually last year when we got our shots none of the kids really cried. The good thing is we always go out for ice cream after someone gets shots. CRAP! I just realized.. I can't have ice cream! I have been looking forward to a chocolate diped cone! Aw man! I guess I will just have to watch them eat theirs and dream about it. Now I am really feeling sorry for myself! My 'not a baby shower' went really well. Several people turned up saying, 'i'm very sorry I can only stay for an hour'. 3.5 hours later we all looked at our watches and went 'errrr, weren't you supposed to leave...'. I got a parking ticket - baby brain forgot to feed the meter. I've just finished covering the nursing cushion (in the same fabric as the bouncinette and DH's chair cushion). It looks pretty good, and I got the zip right, but I think I need to take it off and fit it better. I also made DD alittle back pack to take on her trip (she is going away for 4 nights to a friends farm with the grandparents). We've only been without her that long once before, when we did a huge hike (the 42 Traverse in NZ, went black water rafting, and white water rafting) I'm not sure what we will do without her this time, as I doubt we will be doing anything more than walking into a restaurant or movie theatre. Now I need to finish the 2nd BF pillow, make a toy bag for DD (so she can spread out her pens without spilling them all over the flooor), pack the hospital bag, get DH to help me finalize a girl name. Oh, and get a new desk for a living room. 8 weeks - how hard can it be???? Hope everyone is doing well. It seems like this board is a bit of a ghost town. Only one post every other day or so! When we were on old BBC there were so many more posts. Where is everyone? I had my OB appt. today. Nothing too exciting happened which I'll definitely take. I like the boring appointments! I only gained 1/2 lb in the past 2 weeks so that is good. I really appreciate all of your thoughts and prayers. Again I was extra emotional and actually went to see my therapist yesterday on a non-appt week. And I am feeling better today. I am working from home for the next 3 weeks because of a trip to L&D Sunday night. Kate and I are fine - just having some uterine irratability so I am taking terbutaline every 6 hours and keeping my feet up. When this all came about after my appt Tuesday I was really upset because it reminded me so much of my pregnancy with Jake (which was around this time of the year) - he would have been 3 on Nov 10. But after my appt yesterday with my therapist I am doing better. Kim - glad your not shower was so much fun - too bad about the parking ticket. I'm still so impressed with all of your sewing. Jennifer - I'm so happy Easton turned back again. Sorry about the no ice cream for you treat after the shots - could you get sugar free in a cup? I need to get Luke his flu shot soon. Amy - Good to hear the twins are growing so well. Allison - how are you handling staying at home with out working? I wish I wasn't trying to work 8 hours a day right now - I think I could do 4 without any problems. How are you feeling - I hope you are staying away from L&D. How is your friend with the twins from your other board? Jill - I'm so glad you are being seen weekly. And it made me feel better to know you are emotional too. Quincy - hope you DS is better now - football scares me. But then there are times my DS gets tripped and tackled in soccer and they don't have the padding. Tiffany - I think I already commented on Ryan's room - but if I didn't it looks great and so do you. I wish my tummy was that cute. I'm feeling like a beached whale right now. I am here and not doing well at getting online these days. I get horrible back pain and when I do . I need to try to be better about it and stay caught up with you ladies. I am going to go back and read all the threads and hopefully be able to do some personals with in the next few days!!! Jennifer: Glad Easton looked so good on Monday and very glad he turned. The US tech spoke way too soon huh? Allison. I Know you were having some problems... how are you hanging in there now? Mom-to-Luke: why am I spacing your name today.... sorry about that. guess I have been away too long. I have a name in my head for you , but fear being wrong so I will go with your screen name.. LOL ...sorry to hear about your trip to LD ... Rest... Hang in there. Wait it is KATHY RIGHT??? LOL or am I wrong..
Hi to Quincy, Jill, Tiffany, Tiffany and EOE!!!! HANG IN THERE GIRLS. we are almost done! !